How did life begin on Earth? Is it confined to our planet? Will humans one day be able to travel long distances in space in search of other life forms? 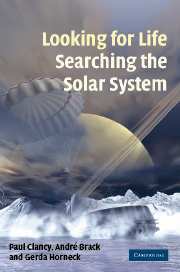 Written by three experts in the space arena, Looking for Life, Searching the Solar System aims to answer these and other intriguing questions. Beginning with what we understand of life on Earth, it describes the latest ideas about the chemical basis of life as we know it, and how these ideas are influencing strategies to search for life elsewhere. It considers the ability of life, from microbes to humans, to survive in space, on the surface of other planets, and to be transported from one planet to another. It looks at the latest plans for missions to search for life in the Solar System, how these plans are being influenced by new technologies, and current thinking about life on Earth. This fascinating and broad-ranging book is for anyone with an interest in the search for life beyond our planet. PAUL CLANCY is a former strategic planning manager within the Human Spaceflight Directorate at the European Space Agency in Paris. His recent duties included planning for exobiological research and the human exploration of Mars, and for European utilisation of the International Space Station. ANDRÉ BRACK is Director of Research Emeritus in the Centre of Molecular Biophysics at the Centre National de la Recherche Scientifique, Orleans, France. His research focuses on the chemistry of the origins of life, and the search for life in the Solar System. He co-founded the European Exo/Astrobiology Network Association in 2001. GERDA HORNECK is a former Head of the Radiation Biology Section and Deputy Director of the Institute of Aerospace Medicine at the German Aerospace Centre DLR in Cologne, Germany. She has coordinated several national and European projects in space biology, biological UV-dosimetry, biosensorics and biomarkers, and has coordinated human survivability in space studies. This book has three intertwined threads which have inexorably come together at this, the dawn of the twenty-first century. Never before has the question of the origin and the destiny of life been stronger in the public and the scientific mind. Although the question ‘What is life and how did it start on Earth?’ has proven difficult to answer, despite significant research over recent decades, at least we now know a lot more about its molecular machinery than we did when Harold Urey and Stanley Miller did their famous amino acid generating experiments 50 years ago. And this should help us greatly in looking for the signatures of life in an extraterrestrial context. The discovery of such signatures might eventually allow us to answer the question ‘How did life originate and where did it come from?’ And if there is extraterrestrial life, can we find it out there in the Solar System? The second thread is then the issue of whether or not humans are capable of long-duration interplanetary flights and long-term survival on inhospitable planetary surfaces. The third thread sets the question: if humans are capable of such voyages, do we have a real, active role to play in the search for life in far-flung planetary environments within the Solar System? The authors share a passionate belief that the destiny of humanity is strongly linked to its outward exploration of the vast spaces and resources of the Solar System and ultimately the Galaxy. They also share a strong belief that the public at large is fascinated by this subject, and is broadly aware that it could have enormous consequences for the future of our children and grandchildren. The authors also believe that the public is keen to know how terrestrial life fits into the vast astronomical picture now painted by modern science, how life originated and how widespread it is in the Universe. The authors have played leading roles in recent studies carried out in a European context in key areas such as exobiology and the search for life in the Solar System, as well as the survival prospects for humans in long-duration spaceflight and on planetary surfaces. They feel that the results of these studies merit exposure to a wide audience. This book is not about an evangelical call to aggressively colonise and exploit other planets of the Solar System, but rather to explore them in a spirit of respect, and recognition of the central place played by diversity in the rich phenomenon of life. It covers a wide range of subjects across the spectrum of issues related to the exploration of and search for life in the Solar System. As a result, the material covered has a wide range of accessibility for the reader. Readers interested in the general challenges and motivations for exploration will find Parts I, IV and V the most relevant to their interests. Those readers looking for the latest information regarding our present knowledge about the chemical basis of life, and how that relates to the survival of life in hostile environments as might be found on other planets, as well as the universal signatures of life, will find all this in Chapters 2, 3 and 5 in Part II. Chapter 4 covers the latest ideas about the possible traffic of living organisms between planets. Part III deals with what we now know about how humans can survive in space, and potentially on the surfaces of other planets, and how humans could be directly involved in the search for life on other planets as well as the ethics involved in those searches. Parts IV and V round out the story by explaining the technologies that will be needed for this exploration, how the exploratory programme itself could play out in the coming decades and how the philosophical, societal and economic impacts of this exploration will be felt.